10 White Boots You Didn’t Think You Needed Until Now — EveryStylishGirl. The list of fashion faux pas is shrinking and white after Labor Day was just removed. 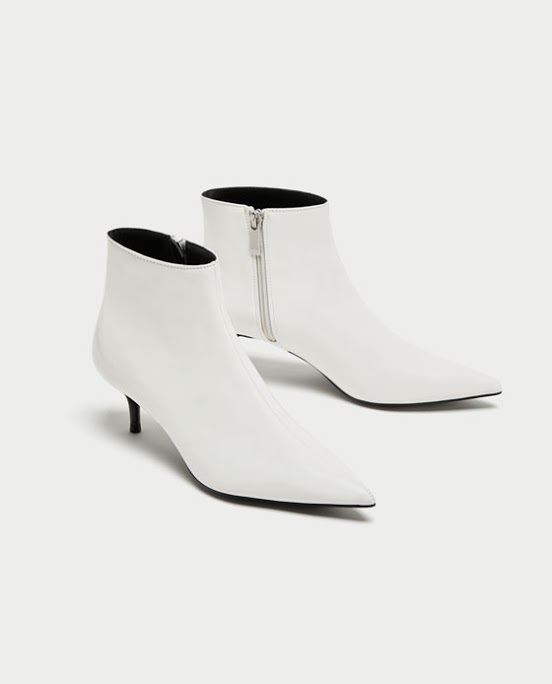 White footwear has been trending since summer rolled around, but as we transition into fall and winter, white boots are coming in hot. Trading in your white kicks for white booties? You’re not the only one. Rihanna, Sofia Richie and Kourtney Kardashian were spotted sporting this fresh and clean trend. The beauty of this trend lies in its versatility as it caters to every style type. It looks like the classic black ankle bootie (that we all know and love) is giving up the spotlight for the new and improved white boot. Here are some variations of the white boots trend that you have to try out this fall! Add a couple of inches without sacrificing comfort! You can walk miles around the city in these boots without worrying about blisters or achy soles. Aside from the comfort, this white leather boot works well for most fall festivities; pumpkin patches, Thanksgiving dinners, and fall festivals. Elongate those legs with this ruched, leather boot! While the weather's still mild, this is a great pair of boots to wear with printed skirts or wax denim. This style comes in a variety of colors but white makes the biggest statement. Strut around the city in the Carrie boot and you are guaranteed to feel confident and chic. Perfectly paired with baggy bottoms and flowy silhouettes, these white sock booties will create an element of sophistication. If you already own these in black and green, there’s no harm in adding to the collection! Let’s just say leaving out the chelsea boot would do an injustice to the fashion world! This boot has been around for decades and always seems to reappear around the fall time. Slip these bad boys on and off with ease as you navigate through a fall day. A pointed toe and stiletto heel to turn heads! These lace up booties take the sock booties up a notch. Lucky for you, these boots have an exposed zipper on the side, eliminating the long process of lacing up your boots every time you step out of the door. We can always count on Jeffrey Campbell for footwear that pushes the envelope. Covered in silver studs of varying sizes, this boot adds dimension to any basic outfit. The sculptural chunky heel truly embodies the Western boot that can be worn to any casual event. A little foot action for warmer days! The transitional period between seasons is always tricky but these Calvin Klein booties give you the best of both worlds. Not ideal for braving the cold weather but perfect for a chilly night out. Dr. Martens will always be in style but all white docs are here to shake things up. People usually gravitate toward combats boots for a grungy statement shoe that can withstand any climate. What better way to make a statement than to shock people with your clean, all white doc martens? In search of a simple pair of boots with an edgy detail? Look no further, these BCBGeneration booties combine several of the boot trends previously mentioned without being overdone. The contrast between the black and white is eye-catching so prepare for endless compliments.